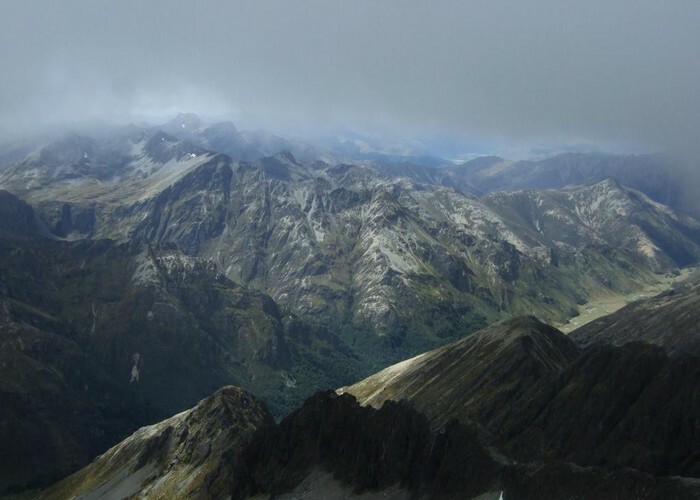 The Eyre Mountains are located south of Lake Wakatipu, just next to the Mavora Lakes. Jane Peak is the highest mountain in Southland outside of Fiordland -- and presumably a wry reference to the 1847 novel by Charlotte Brontë. Eyre Creek • By Matthew. Licence: C.
Adapted from notes by Stephen Martin, with permission. Gorge Burn • By Matthew. Licence: C.
Jane Peak is definitely worth ticking off, it needs to be done otherwise you have that uneasy feeling every time you drive past the Eyre Mountains of not having been to the crest of them yet knowing it is very doable. 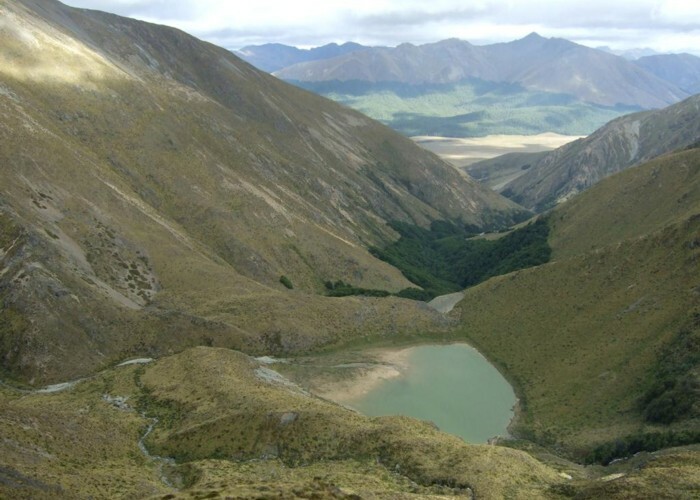 From SH94, the Te Anau-Mossburn Highway, take the turn-off to Mavora Lakes. Follow the road north and turn onto Mount Nicholas Road just before the lakes. Stop at Gorge Burn ford. Walk up the riverbed on the true left, sticking as close to the bed or often preferably in it as much as you can. It is quite open for at least a km. If it makes sense to cross side channels to keep a direct line do so, you can do this and have dry feet. Try to stay off the terrace on the true left as it is boggy, or if it makes sense stay right on the edge of it. The open bed will visibly narrow somewhere. Before it has narrowed keep a look out across to the true right side where you might spot some short fragments of rigid blue reflective tape. This is not long attention seeking flagging tape so you will have to look for it. When seen (or alternatively when you see beech trees close to the true right river bank) cross to the true right. By doing this you will miss matagouri on the true left. Generally follow the blue tape. You will be in mountain beech on the true right for a while, the river does a 90 degree right turn and you just follow it and the blue tape for a while. From memory you will emerge somewhere onto a short section of open river bed, this may be unmarked for a couple of hundred metres in the bed. Towards the end of this open bed section I think we went up but only a little bit on an open slope, then through a gap in a narrow grove of beech, then the blue tape leads you up and around the fringe of the beech that encloses the river and its invisible gorge. So you will have open slopes to your left and beech to your right, and you walk in the open on the edge of the forest. There is blue tape here and there on the forest edge. At some point the tape re-enters the beech in a slightly covert way, I think this might be close to Ian's Place, the remains of an A frame timber hut just inside the forest. From here a ground trail leads up within the beech (still with tape fragments). 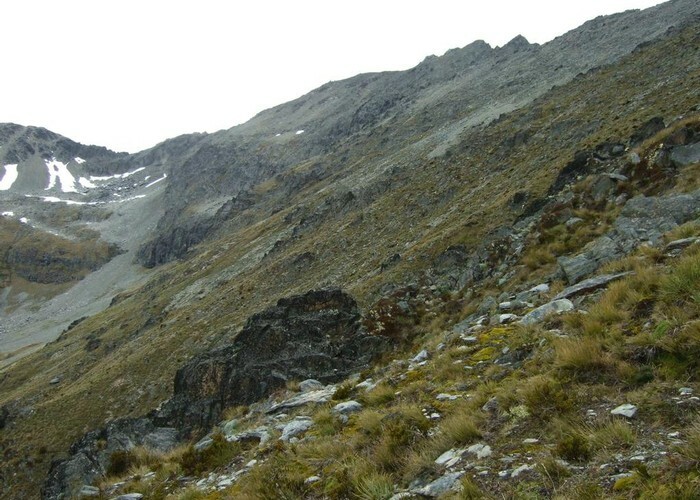 There is a bluffy rock in the bush where there is a minor descent / ascent / descent / ascent sequence in the vicinity. More beech and you will emerge to cross a narrow incised gravel gully to a grassy hillside with some good spaniards I think. Make a rising contour across this unmarked slope and you will come to a stream gully with eroded sides. Follow the crest of this eroded slope up and around to where the stream exits from a puddle lake that reminded me of a sewerage treatment pond due to its opaque waters and uniformly straight sides. We camped on a small terrace just above the true right of a small stream flowing in to the lake on its SW shoreline (200m to your right as you arrive at the lake). Jane Peak • By Matthew. Licence: C.
From this terrace we went straight up behind it to a flattish initial section leading to a tiny incised stream. We crossed this kind of where the flat section ran out and got close to the stream and then went up the least steep spur behind the stream all the way to the main ridge between 1642 and 1913. Take very good note of where you arrive at the main ridge for future reference as it all looks very similar on the return. Follow the main ridge all the way to the top. Sometimes it is easier to go lower on the Fiordland side to round a few rock outcrops. We hear that the stream and small tarns immediately west of and well below Jane Peak leading back to sewer lake are very pretty so would make a nice loop if you can get to them - don't know how easy this is from the summit. Otherwise go back the same way. We turned off the main ridge too early so had a steeper descent than necessary but it was still fine. Added 13 March 2013 by MatthewMatthew. 1 revision 13 March 2013 by MatthewMatthew.